Comments Off on What is Urban Agriculture and why is it important? What is Urban Agriculture and why is it important? Urban agriculture can be defined shortly as the growing of plants and the raising of animals within and around cities. The most striking feature of urban agriculture, which distinguishes it from rural agriculture, is that it is integrated into the urban economic and ecological system: urban agriculture is embedded in -and interacting with- the urban ecosystem. Such linkages include the use of urban residents as labourers, use of typical urban resources (like organic waste as compost and urban wastewater for irrigation), direct links with urban consumers, direct impacts on urban ecology (positive and negative), being part of the urban food system, competing for land with other urban functions, being influenced by urban policies and plans, etc. Urban agriculture is not a relict of the past that will fade away (urban agriculture increases when the city grows) nor brought to the city by rural immigrants that will loose their rural habits over time. It is an integral part of the urban system. The rapid urbanization that is taking place goes together with a rapid increase in urban poverty and urban food insecurity. Urban agriculture provides a complementary strategy to reduce urban poverty and food insecurity and enhance urban environmental management. Urban agriculture plays an important role in enhancing urban food security since the costs of supplying and distributing food to urban areas based on rural production and imports continue to increase, and do not satisfy the demand, especially of the poorer sectors of the population. Next to food security, urban agriculture contributes to local economic development, poverty alleviation and social inclusion of the urban poor and women in particular, as well as to the greening of the city and the productive reuse of urban wastes. 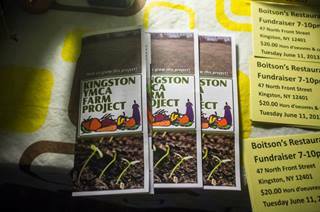 The Kingston YMCA Farm Project celebrates its first year as a working “farm”. The community is invited to a harvest party and film screening of “Growing Cities (a film about urban farming in America)” on Tuesday, September 23rd starting at 5:30pm. Kingston, NY – The Kingston YMCA Farm Project located behind the YMCA just off of Susan and Summer Streets in Kingston invites the community to celebrate its first successful year of farming on Tuesday, September 23rd 2014. Activities for children, music food and an auction begin at 5:30pm. An outdoor screening of “Growing Cities – a film about urban farming in America” sponsored by the Kingston Urban Agriculture Committee will begin at 7:30pm. The event is free to all with a suggested tax deductible donation of $10 for adults / $5 for kids that will go towards the farms’ educational programs in 2015. In its first year on a 1/4 acre, the YMCA Farm Project has harvested conservatively 1200 pounds of produce between June – August. With a longer growing season, Wimbish expects to continue to produce through late October. At any given time, the farm serves between 25-40 people weekly through their farm stand that operates out of the YMCA on Broadway, a real crossroads in midtown Kingston with a high volume of food traffic as well as a new mobile market that travels throughout the City of Kingston offering the farm’s produce. The mobile market is a new effort in Kingston’s Urban Agriculture movement, attempting to bring produce to community centers and to underserved communities. The goal is to make it as easy as possible for people to eat fresh, local and chemical free food. Cycled by Wimbish with help from youth participating in “The Dig Kids”, the mobile market visits locations throughout the city that includes: The Oncology Support Center, Yosman Towers and the Kingston Public Library. Both the mobile market and the YMCA Farm Stand accepts SNAP (Supplemental Nutrition Assistance Program) and Farmer’s Market Nutrition Program checks. The YMCA Farm Project also hosts a number of programs that include “The Dig Kids (an urban farming program)” (a program of Family of Woodstock’s Kingston Cares with support from Larrecca Music Management and Croswell Enterprises) that selects youth through an application process to be paid a small stipend while learning farming practices, the YMCA’s School’s Out Afterschool program, YMCA’s Camp Starfish and Little Farmers Story Time and Garden Play. The Kingston YMCA Farm Project Community Harvest Party & Film Screening will occur on Tuesday, September 23rd beginning at 5:30pm with children’s activities, music, food and an auction. The film “Growing Cities – a Film about Urban Farming in America” will be shown outdoors at 7:30pm and is sponsored by the Kingston Urban Agriculture Committee with support from Family of Woodstock, O+ Festival, Kingston Land Trust, Kingston Transition, NY, and the Local Economies Project of the New World Foundation. About the film “Growing Cities (a film about urban farming in America)” – In their search for answers, filmmakers Dan Susman and Andrew Monbouquette take a road trip and meet the men and women who are challenging the way this country grows and distributes its food, one vacant city lot, rooftop garden, and backyard chicken coop at a time. Join them as they discover that good food isn’t the only crop these urban visionaries are harvesting. They’re producing stronger and more vibrant communities, too. About the Kingston YMCA Farm Project – The Kingston YMCA Farm Project’s mission is to educate and empower young people by directly engaging them in sustainable food production on an urban farm. Participants will learn and practice the skills needed to produce their own food and to make healthy choices throughout their lifetime, while increasing the community’s access to fresh produce. The mobile market bicycle and trailer were made possible through Cornell Cooperative Extension’s Creating Healthy Places with support from Rondout Savings Bank. Support for Educational programming has been provided by Alcoa. About the Kingston Urban Agriculture Committee – The Urban Agriculture Committee (UAC) is charged to promote community-based, small-scale, entrepreneurial farming by providing education and technical assistance to people interested in urban farming through research and policy development aimed at making urban farming an integral part of a lively and viable cityscape, and through working with our community to embrace and support urban farms. Please have a look at the materials below that include the final report of the Urban Agriculture Zoning Project, a recent Climate Smart Webinar, radio interview on KCR, Kingston, a letter of support from the Kingston Conservation Advisory Council and a draft resolution for Kingston’s Common Council for review. If you are supportive of Urban Agriculture in Kingston, do your part by attending Kingston’s Public Safety Committee meeting that will take place on Wednesday, April 23rd, 2014 at 6:30pm at Kingston’s City Hall located at 420 Broadway. The meeting will be held in Conference Room #1 on the top floor of the building. LISTEN: Climate Smart Webinar Presentations, Dept. of Env. Conservation and WKCR, Kingston. 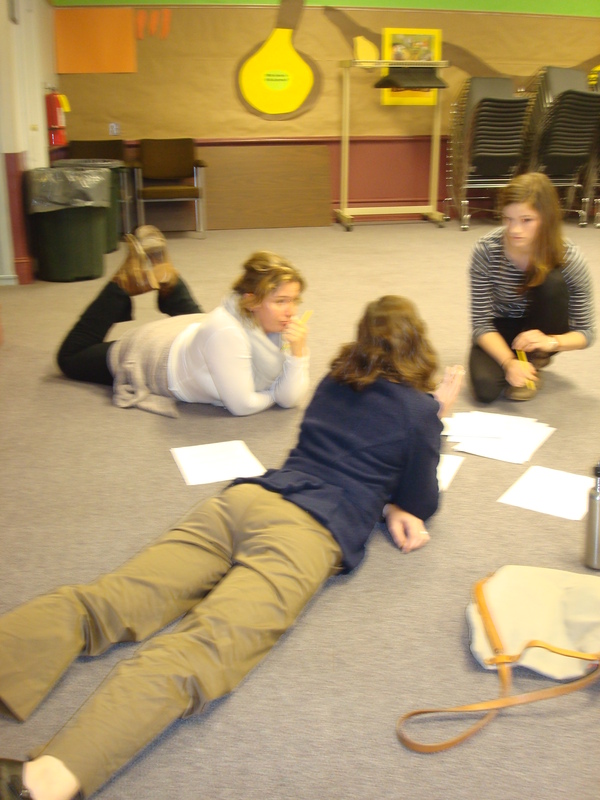 KCR, Kingston: Jennifer Schwartz Berky, Michael Berg and Megan Weiss-Rowe discuss Urban Agriculture Project. Click on image to view powerpoint slides. 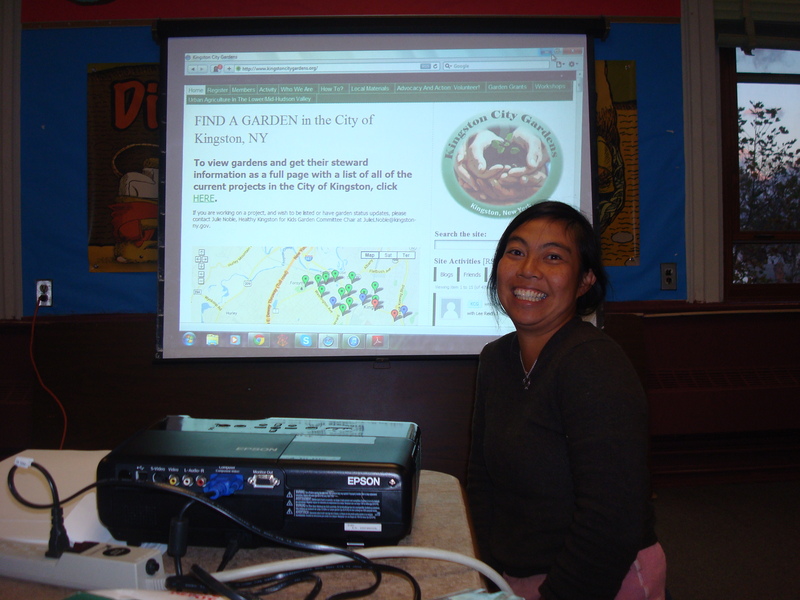 Now the Urban Ag Zoning Project Planning and Zoning Study powerpoint is available! Click on the image above to view. The Kingston YMCA Farm Project, located on the corner of Susan and Summer streets in Midtown Kingston, announces its “Indiegogo” crowd sourcing campaign that began on March 1st and will run through April 15th of 2014. The group’s goal of $10,000 will help to help provide the necessary resources for its 2014 growing season. In its first season, the new 1/4 acre farm will become a place of learning and local food production for youth and the community by incorporating the YMCA’s after-school and summer camp programs, exposing hundreds of youth to life on the farm. Along with a farm, the space is shared with Kingston’s largest community garden (hosting more than 20 raised beds) and a compost heated greenhouse/community growing space. Plans are in the works to create a farm stand and bike powered mobile market to deliver vegetables throughout Midtown, Kingston. Additionally, the group will host a “Spring Celebration” on Thursday, March 20th at The Anchor, 744 Broadway in Kingston with special menu and drink items, raffles and more. The cost will be $10 at the door, and free to those who already made a contribution to the online indiegogo campaign. The Kingston YMCA Farm Project is a part of the growing urban agriculture movement in the City of Kingston, NY located 90 miles North of New York City. Recently, a group of citizens created an Urban Agriculture Committee that worked to develop updated farm code and zoning language to advance urban agriculture for its citizens. About the Kingston YMCA Farm Project: The Kingston YMCA Farm Project’s mission is to educate and empower young people by directly engaging them in sustainable food production on an urban farm. Participants will learn and practice the skills needed to produce their own food and to make healthy choices throughout their lifetime, while increasing the community’s access to fresh produce. About the Kingston YMCA Farm Project Farmer: KayCee Wimbish is an educator and farmer and is thrilled to have this opportunity to combine her two passions at the Kingston YMCA Farm Project. She has a Master’s in Education from Bank Street College of Education, and over 10 years of teaching experience. She taught elementary schooI for five years before pursuing her interest in farming. She currently teaches vocational English as a Second Language to adults who are studying to be Nursing Assistants. For the past two years she has taught food preservation classes at libraries and in people’s homes. She has been farming in the Hudson Valley for the past 7 years, working at Hearty Roots Community Farm, a vegetable farm that uses the Community Supported Agriculture (CSA) model. She also owned and operated the former Awesome Farm, a pasture based animal farm, raising cattle, sheep, turkeys and chickens. In 2013 she was the grower at South Pine Street City Farm and the farmer educator for the Dig Kids, an urban farming program for teens in Kingston. The group looks forward to the opportunity to discuss this work with the Kingston 2025 Comprehensive Planning committee to support the integration of these DRAFT recommendations into the comprehensive plan and zoning (click on the links below to download and view). The Kingston Urban Agrculture Zoning Project is a program of the Kingston Urban Agriculture Committee in partnership with Family of Woodstock, Land Use Law Center for Sustainable Development at Pace Law School (Jeffrey P. LeJava), Hone Street Strategic LLC (Jennifer Schwartz Berky) and Larrecca Music, Inc.
Made possible by generous public support including a donation from Kevin McEvoy and Barbara Epstein. The attached report was written and researched by Jennifer Schwartz-Berky, principal of Hone Strategic, LLC with legal research support from Jeffrey P. LeJava, managing director of Land Use Law Center for Sustainable Development of Pace Law School. The Kingston Urban Agriculture Commmittee Completes “Phase I” of the Urban Agriculture Zoning and Code Updates for Kingston, NY. The partners worked closely with the City of Kingston’s Conservation Advisory Council for guidance to implement the work into the current comprehensive planning process. Kingston, NY – Since September of 2013, the Kingston Urban Agriculture Committee has been working towards completing a “Phase I” effort to update urban agriculture initiatives with revised zoning code provisions to implement into Kingston’s current Comprehensive Planning process. Led by Kingston’s Urban Agriculture Committee in partnership with the Land Use Law Center for Sustainable Development at Pace Law School (with Managing Director and Adjunct Professor Jeff LeJava), Larrecca Music Management (project coordinator Rebecca Martin who is the former Executive Director of the Kingston Land Trust) and Family of Woodstock, Inc., the group hired Hone Strategic, LLC (an urban planning firm led by Jennifer Schwartz Berky, former Deputy Director of Planning for Ulster County) to provide research and updated language so that the City of Kingston supports local food production and allows urban agriculture to flourish. With this initiative, Kingston will lead the Hudson Valley as an innovator in this increasingly popular local food movement. Along with completing draft recommendations, consultant Jennifer Schwartz Berky of Hone Strategic presented their work in progress on December 6th 2013 on Urban Agriculture Opportunities in Kingston at the Pace Law School Land Use Law Center’s 12th annual Land Use and Sustainable Development Conference. This year’s conference, entitled “Leading Communities Toward a Resilient Future,” focused upon the challenges communities in the New York Metropolitan area face because of natural disasters, a changing climate, new demographics and technologies, and inequitable living conditions. The Center’s annual conference is a significant educational event in the region, with more than 200 attorneys, business professionals, and local leaders in attendance to learn about national, regional, and local innovations, challenges, and best practices. Session topics included coastal redevelopment, flood plain regulation, complete streets, hydrofracking, urban revitalization, solar panel permitting, green infrastructure, urban agriculture, property rights, and form based infill development. Berky presented in a session organized and moderated by Jeffrey LeJava, Managing Director at the Center and collaborator on the Kingston study alongside presenters from Boston, MA and Newburgh, NY. The event provided a robust comparative view of the similar issues and challenges faced in each of these communities in their efforts to implement urban agriculture. The Urban Ag Committee alongside consultant Jennifer Schwartz Berky has presented on several occasions to the City of Kingston’s Conservation Advisory Council (CAC) in 2013 for guidance and input. The CAC is a volunteer advisory body that works to ensure the sustainable use of Kingston’s natural resources and the enhancement and protection of its environment while coordinating with local groups which have an impact on the local environment and working in cooperation with the Kingston Planning Board and Common Council to make sound environmental decisions. A final draft will be presented to the CAC at their next meeting on February 6th at Kingston City Hall. About the Kingston Urban Agriculture Committee The Urban Agriculture Committee (UAC) is charged to promote community-based, small-scale, entrepreneurial farming by providing education and technical assistance to people interested in urban farming through research and policy development aimed at making urban farming an integral part of a lively and viable cityscape and to encourage our community to embrace and support urban farms. About the Land Use Law Center for Sustainable Development at Pace Law School Established in 1993, the Land Use Law Center is dedicated to fostering the development of sustainable communities and regions through the promotion of innovative land use strategies and dispute resolution techniques. Through the work of its programs, centers, and institutes, the Land Use Law Center offers conferences, seminars, clinics, academic law school courses, continuing legal education programs, audio podcasts, and frequent publications and resources on contemporary land use, real estate, and environmental issues. About Larrecca Music Management LMM is charged in providing support and strategy for our clients, paying close attention to their creative goals, musical endeavors and legacy. With a focus on education, community and healthy living, our group is dedicated to developing programming that can inspire those young and old in their creative pursuits. About Family of Woodstock, Inc. Since 1970, FAMILY has been an anchor for area residents- a place where people are respectful and caring, and where the search for solutions is creative and tireless. FAMILY’s shelters, emergency food pantries, court advocates, counseling and case management services, hotlines, and child care supports all work together to help people achieve the changes they seek. About Hone Strategic, LLC. Specializing in the adaptive revitalization, reuse and development of unusual and exceptional buildings and places, Hone Strategic’s prinicipal and founder Jennifer Schwartz Berky has worked for 30 years as an urban planner, community development specialist and conservation and development consultant for organizations such as New York City’s Division of Design and Construction Management, the World Monuments Fund, the World Bank and for government agencies and NGOs in Jerusalem (Israel), Rome (Italy) and several other cities abroad. Before founding Hone Strategic in 2012, Berky was Deputy Director of Planning for Ulster County for eight years. The Kingston Urban Agriculture Zoning Project was made possible by generous public support including a donation from Kevin McEvoy and Barbara Epstein. As part of our work on the Urban Ag Zoning Study that we are currently undergoing, it would be very valuable for us to get your input on a “vision statement” for Urban Ag in Kingston. 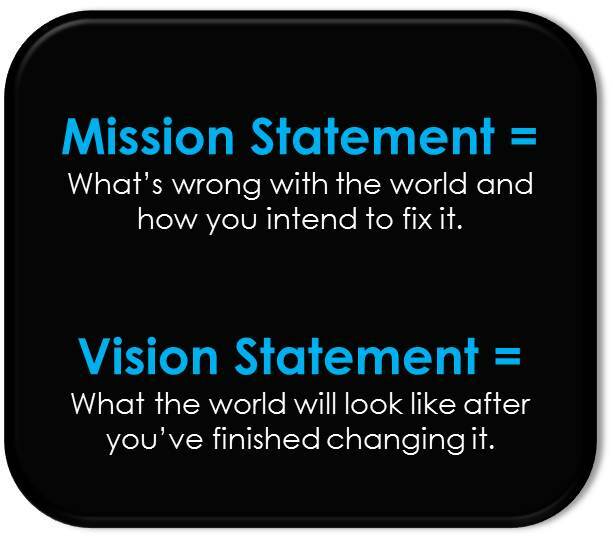 Please look at the examples of vision statements from other communities on a range of things, beginning with Burlington, VT, a city much like Kingston that has made great progress in urban ag. You can send any words or phrases of your own (or that you like from here) that you believe should be included to Rebecca Martin at rebecca@larreccamusic.com – you may also leave your input in the comment section of this blog post. A draft statement will be developed to share with you that incorporates all of the phrases and ideas of other stakeholders involved in this process. 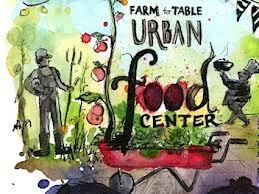 Urban Agriculture Committee Hosts Visioning Session. New Sub-Groups Are Formed. 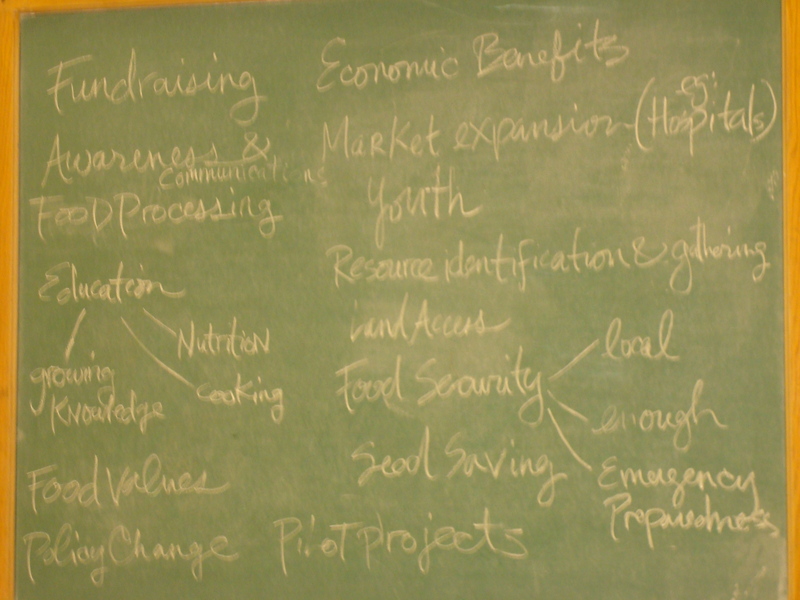 What are some of the needs on the Urban Ag front in Kingston? The Kingston Urban Agriculture Committee hosted a visioning session on Tuesday, October 22nd at the Kingston Public Library. 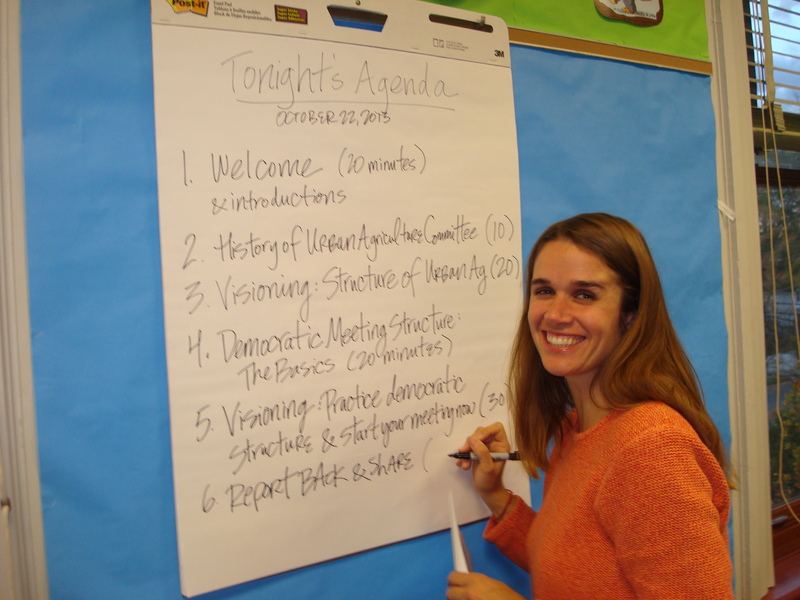 Moderator Corinne Wolcott prepares the agenda for the evening. Some twenty people attended that included farmers, organizers, academics, nurses and many others of affiliated trade. 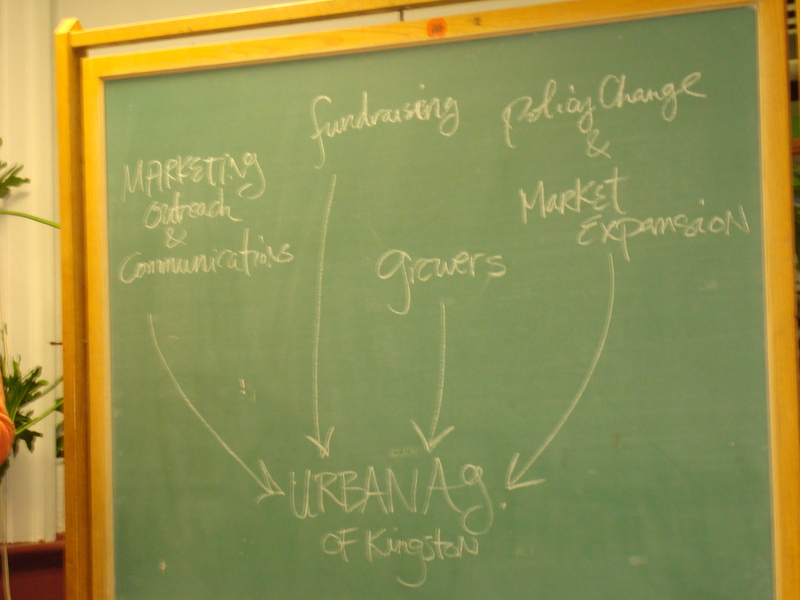 After some explanation from moderator Corinne Wolcott on a democratic leadership model, the group participated in a visioning session to identify the needs on the Urban Ag front in the city of Kingston. The four categories that arose were: Community Outreach; Fundraising and Grants; Growers; Policy Change and Market Expansion. The four groups will work independently, meeting as often as is necessary while reporting back to the Urban Agriculture Committee each month with any necessary updates or progress. These four important categories were decided upon that evening, and small groups were formed based on their individual interests. Break-out groups around topics were formed. Farmer Jesica Clark, founder of the South Pine Street City Farm and co-founder of the Dig Kids – an Urban Farming Program. 596 Acres works to assist communities to research and access public land and develop plans and campaigns to advocate for changes in land use. They have been working with partners in New York City and are now working in Philadelphia, Los Angeles and New Orleans. Paula Segal of 596 Acres, Amy Laura Cahn, Public Interest Law Center of Philadelphia, Mark Glassock and Hector Gutierrez, Community Health Councils, Los Angeles, and Sanjay Hharod, New Orleans Food & Farm Network will discuss their efforts and share their progress. Call participants will be able to ask questions of the panelists. Paula Z. Segal is the founding director of 596 Acres, a New York City-based community land access advocacy organization, a project of the Fund for the City of New York. As an attorney, she is the legal director of the 596 Acres Community Land Access Program, through which 18 groups have formalized relationships with municipal entities to use public land, 10 others are organized and nearing completion of their negotiations and over 100 other groups are working towards transforming their neighborhood holes into resources. 596 Acres’ model is based on a process of transforming municipal data into information and placing that information in contexts where it can spur action. We are sharing this process with advocates in other cities through groundedinphilly.org, laopenacres.org, and livinglotsnola.org. We just found out that 3000acres in Melbourne got funding to replicate our model there independently. Amy Laura Cahn is the director of the Garden Justice Legal Initiative of the Public Interest Law Center of Philadelphia. GJLI supports community gardens and market farms in disinvested neighborhoods in the Philadelphia area through legal and policy advocacy support, community education, and organizing. This year, we worked with 596 Acres to launch Grounded in Philly <http://groundedinphilly.org/>, a mapping and organizing webtool aimed at supporting community driven land-based projects by making information transparent — about vacant land, pathways to legal land access, and opportunities for organizing on a block- and citywide level. Community Health Councils is a non-profit, community-based organization health education and policy organization. Established in 1992, CHC’s mission is to promote social justice and achieve equity in community and environmental resources for underserved populations. Mark Glassock, is a Policy Analyst on the Environmental Health team, and works to increase the amount of green space in South Los Angeles in partnership with multiple coalitions convened by CHC. Mark serves as principal staff managing the LA Open Acres project that aims to increase the level of transparency on vacant space in green space poor neighborhoods. Mark also serves as a steering committee member on the Los Angeles Food Policy Council’s Urban Agriculture Workgroup. New Orleans Food & Farm Network (NOFFN) is a food justice organization focused on creating sustainable sources for fresh food in New Orleans. Established in 2002, NOFFN has helped to incubate many asset-based food projects throughout the City by providing organizational support, capacity-building, and technical assistance. This year, we are working with 596 Acres to launchLivingLotsNOLA.orgto provide information on available vacant land in New Orleans and to suggest pathways to acquire this land for land-based projects.LivingLotsNOLA.org is one of the tools in the FarmCity Toolbox that is being developed to address the 4 main obstacles for urban farming projects – land issues, training/mentoring, financing, and accessing markets. The Toolbox along with our Farm This Now! Organizing – Community Surveys, Vacant Lot Labeling, Project Development, Neighborhood Farming Workshops, and Catalyst Projects – aims to build the power of neighborhoods often left out of the envisioning, decision- making, and initiation of projects.